Scigrip 16 is a very high strength, clear, medium bodied, fast curing, solvent-type acrylic cement. Applied to cast, moulded or extruded acrylics, it will affect initial bonds very quickly so some parts may be handled within a few minutes. Scigrip 16 is a very high strength, clear, medium bodied, fast curing, solvent-type acrylic cement. Applied to cast, moulded or extruded acrylics, it will affect initial bonds very quickly so some parts may be handled within a few minutes. Bond strength continues to develop very rapidly reaching a substantial level and forming strong joints within hours. Initial bond forms very quickly so some parts may be handled within a few minutes of application. Joints are water and weather resistant and will generally have similar physical and chemical properties to acrylic plastic. 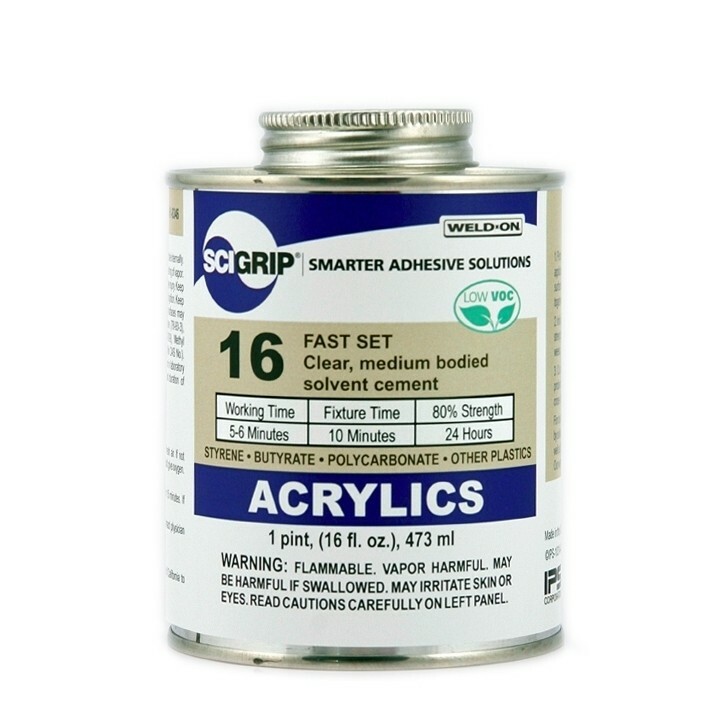 Scigrip 16 is recommended as an excellent general purpose, high strength acrylic cement. It is especially useful where fast cure and high strength are desired for applications such as large housings, signs, plastic letters, industrial fabrications, display items, lenses and models. Scigrip 16 is especially formulated to bond acrylic (poly-methyl methacrylate) plastic. It can also be used for bonding styrene, butyrate, PVC, ABS and polycarbonate, as well as other plastics and porous surfaces.